If you follow a well-balanced diet with plenty of nutritious foods, you probably get all the nutrients you need every day. However, at certain times of your life, including childhood, pregnancy and old age, you may need to supplement your diet by taking a multivitamin. Additionally, if your magnesium levels are low, your physician may advise you to look for a multivitamin containing magnesium. A wealth of multivitamin products are available over the counter, so ask your physician which is best for you. Be sure to read the label to determine how much magnesium and other nutrients a specific product contains. Every organ in your body needs magnesium -- especially your heart, kidneys and muscles. It helps produce energy, activate hormones and regulate your calcium levels. You need different amounts of magnesium at different times in your life. According to the Office of Dietary Supplements, male and female children under age 14 need 80 to 240 milligrams of magnesium daily; at ages 14 to 18, boys need 410 milligrams of magnesium per day, and girls need 360 milligrams. Men require 400 mg to 410 daily milligrams of magnesium and if you are a woman, you need 310 to 360 milligrams daily, depending on whether you are pregnant or breastfeeding. Read labels, as amounts vary, but a typical adult multivitamin contains about 100 milligrams of magnesium, 25 percent of the daily value, according to the U.S. National Library of Medicine. Many multivitamins contain this amount of magnesium because the mineral is readily available in many popular foods, including spinach, potatoes, peanut butter, soybeans and milk. Along with magnesium, adult multivitamins generally provide vitamins A, C, D, E, K and all eight B vitamins, as well as calcium, iron, phosphorus, iodine, zinc, selenium, copper and manganese. Other nutrients include chromium, molybdenum, chloride, potassium, nickel, tin, silicon, vanadium and boron. For children, many companies offer chewable products. Each chewable tablet contains about 40 milligrams of magnesium, 10 percent of the daily value for children aged 4 and over, according to the U.S. National Library of Medicine. Each chewable multivitamin also contains the eight B vitamins and vitamins A, C, D, E and K, along with calcium, phosphorus, iodine, zinc and copper. These vitamins also provide iron, chromium, molybdenum and manganese. Talk to your children's pediatrician before adding a multivitamin to their diets. 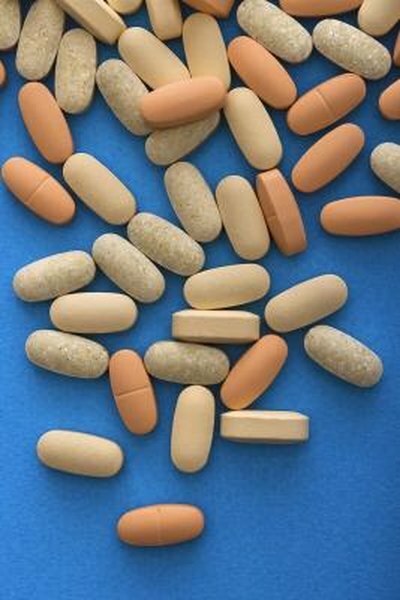 Generic and store brand multivitamins often cost less and are just as effective. You can look for store brand multivitamins at many pharmacy chains. They commonly contain approximately 100 milligrams of magnesium, along with calcium, phosphorus, iron, iodine, copper, selenium, zinc, vitamins A, C, D, E, K and the eight B vitamins. They also may provide molybdenum, manganese, selenium, chromium, chloride, potassium, nickel, tin, boron, vanadium and lutein.